Now available – pd-la USB sticks. 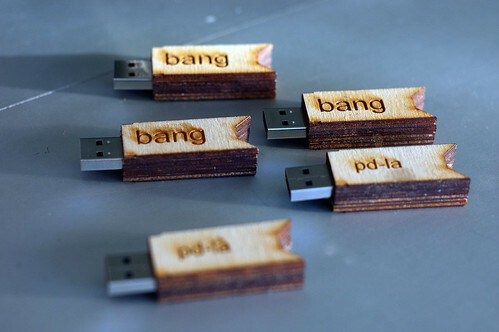 These are 16 GB USB flash drives in custom-built wood enclosures made on the CRASHspace laser cutter. 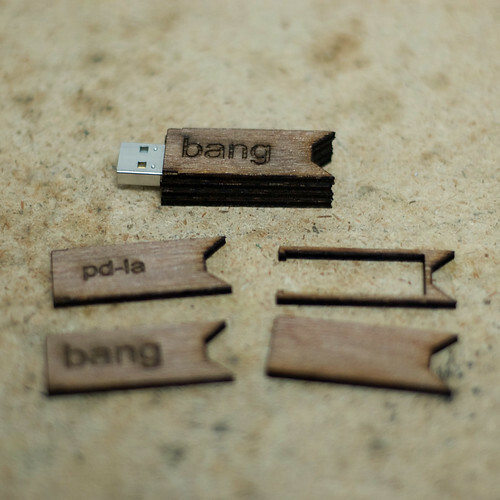 They are in the shape of a Pd message box, and say “bang” on one side and “pd-la” on the other. The sticks contain videos of all 20 lectures from Miller Puckette’s MUS171 computer music class at UCSD. These videos are a little rough, but they are an excellent course in Pure Data and computer music design. They are $40 in the CRASHspace store. Note that CRASHspace does not ship purchases – you have to pick up the stick in person. Please contact me at theron.trowbridge@gmail.com to make arrangements after pd-LAunch week. This Saturday will be the pd-LAunch party at CRASHspace, from noon until whenever we get done. Noon to 2:00 PM will be the first meeting of the pd-la patching circle. This informal meeting of patching and patchers (Pd, Max/MSP/Jitter, etc.) is free and open to anyone interested. Come work on personal or professional projects, school work, or just patch quietly to yourself, in a room full of other people patching patches and helping other people patch. 2:00 – 4:00 PM – Pure Data workshop. Details to come, but this will be a free, introductory workshop on Pure Data. 5:00 – ???? PM – pd-LAunch Party. Join us for an evening of music performances, demonstrations, and discussion about Pure Data. Performers TBD. Max Mathews, computer music pioneer and namesake of the computer performance software Max , died yesterday from complications due to pneumonia at the age of 84. Max pioneered computer music with his programs for the IBM 704 mainframe in the late 1950’s. A famous early piece was “Daisy Bell” (AKA Bicycle Built For Two), which was made famous as HAL 9000’s final performance in Stanley Kubrick’s 2001: A Space Odyssey. There’s a nice profile of Max on the CSounds website, and a good obituary on Synthtopia. Kinsee Morlan wrote an article on Miller, Pure Data, and pd-LAunch titled “The Language Of Invention” in San Diego City Beat. Joseph Deken, president of New Blankets Inc., a nonprofit seeking to expand access to new technologies, and director of research program development at UCSD’s Calit2, says he sees Pure Data going even further. He’s helping organize a new, Los Angeles-based Pure Data meetup group (users call them “Patching Circles”) and has plans for getting the programming language in front of even more people, especially kids. The Pd-LAunch is from 4 to 8 p.m. Monday, April 25, at Calit2 at UCSD. For details or to RSVP, email launch@pd-la.info or visit pd-la.info.com. Please join our mailing list. It’s low-volume, and will be used for updates about pd-LAunch and announcements about upcoming patching circle meetings. It also serves as a local discussion area for any Southern California Pd-related matters. Don’t forget the main Pd mailing lists as well. They’re a great place to get questions answered and learn about Pd developments. As part of the pd-LAunch week, Chris McCormick will be teaching a workshop on using pdlib as a sound engine for other applications on April 29th at CRASHspace. Students will need a laptop and should have Pd-extended installed and working (download for free from http://puredata.info) – it is available for Linux, Mac OS X, and Windows. Space is limited. Cost is $100. Sign up at the CRASHspace store. Miller Puckette, Natacha Diels and Bryan Jacobs will join forces in a presentation of solo, duo, and trio works operating outside their reasonable elements. The group will perform Puckette’s interpretation of Kurt Schwitters’ Ursonate for computer and trio; Rama Gottfried’s BX-51 for solo flute; Bryan Jacobs’ duo Syncro-Vox and Other Cheap Animation Techniques for guitar, alto flute, and electronics; Aaron Cassidy’s vocal piece I, purples, spat blood, laugh of beautiful lips; and a solo presentation of Puckette’s infamous group The Convolution Brothers. Lasercut plywood USB enclosure shaped like a Pd message box. As part of the pd-LAunch week, Hans-Christoph Steiner will be teaching a workshop on using Pure Data for interactive audio and video on April 28th at CRASHspace. Pd provides a wide range of tools for tracking and extracting information from audio in realtime. Once in Pd, we can use the audio to control sound generation, effect, video, camera processing, etc. The combination of audio processing and digital media provide myriad opportunities for creating interactions. This workshop will introduce how to create real-time interaction in the physical world with sound and light. Pd (aka Pure Data) will be introduced as a simple programming environment for real-time interaction. This workshop will be a combination of short lectures, hands-on instruction, and unstructured time to work on learning and exploring with support of the instructor. While Pd is fairly easy to learn and designed for artists, familiarity with basic computer programming will be very beneficial. You will be able to apply the concepts learned in this course to a wide range of programming environments that can receive data via OSC messages or a network socket, such as Arduino, Flash, Processing, etc. Students are also encouraged to bring additional hardware and/or tools they are interested in working with, as long as they are technically self-sufficient with them. Bring MIDI equipment, projectors, etc. to experiment with realtime control. Bring an Arduino with Firmata plus servos or motor controllers to experiment with motion. Or accelerometers, rotary sensors; flex sensors, etc. to experiment with sensing motion. Students will need a laptop with Pd-extended installed and working (download for free from http://puredata.info) – it is available for Linux, Mac OS X, and Windows. The laptop needs to have a microphone and speakers. Space is limited. Cost is $60. Sign up at the CRASHspace store. The week of April 25-30, 2011 CRASHspace and New Blankets will be hosting pd-LAunch!